Warning: history provided by Steve Steinwart, so “fact” may be iffy, off, or just plain wrong. After leaving a local dairy and securing business from customers like Sherb Noble, John opened Meadowvale in Joliet, IL. Yorkville had begun an industrial park, and Meadowvale was one of the first businesses in it. Though the move had John “mortgaged up to his eyeballs,” he put his faith in Meadowvale and took a big chance that paid off. “John was a great salesman. He could sell ice to Eskimos. He was just that kind of guy.” The company continued to grow as John picked up custard business with Leon’s in Milwaukee and Michael’s in Madison. After working for International Dairy Queen (DQ) in Mississippi, Steve joined the managerial team John was putting together at Meadowvale. Steve worked in sales for a few years before becoming general manager in 1990. After John passed away suddenly while recovering from heart surgery, Steve was elected president because, according to him, “there was no one else to make president, really.” In the years following, people integral to the growth and success of the company would join Meadowvale. Brent has been here since February of 1996 and is currently our Warehouse Manager. He oversees everything in the warehouse. Past positions have included production clean up, running the fill line, and also using his CDL license to haul cream. Though significantly smaller when they began buying their mix from Meadowvale (with three Andy’s stores), Andy’s was integral to Meadowvale’s growth. Today, Andy’s has opened over 40 stores. Though significantly smaller when they began buying their mix from Meadowvale (with 2 stores), Freddy’s was integral to Meadowvale’s growth. Today, Freddy’s has opened over 230 stores. After gaining wildly successful business with Andy’s and Freddy’s, Meadowvale set out to expand its facilities to keep up with the growth of its customers. The expansion was completed in 2009. Mark Newport became head of our Quality Control Department in November of 2014 and came to us with over 15 years of experience in dairy. He is responsible for all aspects of food safety and quality at Meadowvale. In 2016, Meadowvale bought a building three times the size of it’s current location, and the team plans to move in 2018. 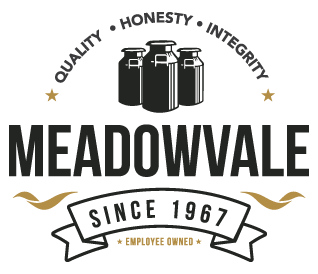 This move not only gives Meadowvale the means to produce over triple its current production, but also offers new opportunities in transportation through dairy tankers.